The City of Leander, originally called Bagdad, was established on July 17, 1882. The first settlers arrived in the area around 1845, receiving bounty land grants in exchange for service in the Texas Revolution. These settlers lived in log cabins and were frequently subjected to being attacked by Indians that also called this area of central Texas their home. If it had not been for the many Indian attacks, the area of Bagdad would probably have been settled earlier. Although, because of these frequent attacks, the Texas Rangers were called in to protect the settlers and they constructed a building that would house up to sixty men. This was one of the first buildings of what is now Williamson County. During the 1850s, the town of Bagdad was surveyed and many businesses began opening. One of the first stores was a blacksmith shop. The first post office was opened in 1858. Although the location was isolated, the abundance of water and timber attracted many settlers. Farming became the mainstay of the area, with the settlers growing much of their own food and making most of their own clothing. Bagdad Cemetery was established in 1857 with the burial of three-year-old John Babcock whose father gave the tract of land, where the cemetery now exists, to the community. The United Methodist church was established in 1860. Bagdad was also a stop on the stage line from Austin to Lampasas; the settlers were now able to have goods delivered to them from Austin. By the 1870s, Bagdad had a hotel, school, several general stores, two blacksmith shops, and several churches. In 1871, the first school was started in Bagdad by the Masonic Lodge; it was the only free school in the area. Church socials played a very important role in the lives of the settlers and were the main entertainment for the early residents of Bagdad. By the 1880s many changes were on the way. The railroad industry expanded to Texas with plans to build tracks through Bagdad’s downtown area. The area was surveyed, lots were sold by the railroad and the new town of Leander was established in 1882. The post office was brought from Bagdad to Leander in 1882 and the first bank, Humble & Chapman, was established. Doctors’ offices, lawyers’ offices, and a drug store had also joined this new community. The cedar post business was prospering, with most of the posts being shipped out by railway. Ranching and farming were increasing. 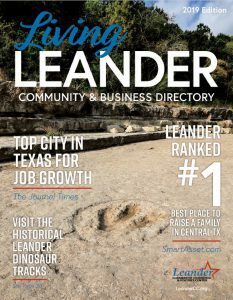 The population of Leander in the early 1890s was estimated to be around 329 people. In 1893, the first public schools were opened both in Leander and Bagdad. On June 7, 1899, the Leander High School Association incorporated under Texas law. On January 21, 1978, the City of Leander was incorporated. The city was continuing to grow more rapidly. A new city hall was established along with some new additions in the old downtown area. With more homes being built in the west part of Leander, the population by the 1990s was 3,398. The Crystal Falls Municipal Golf Course was built and has proven to be one of the most beautiful and challenging golf courses in the area. 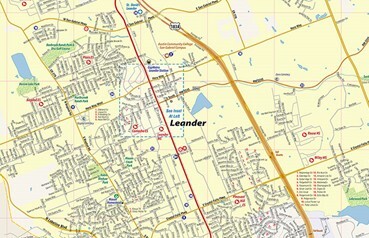 Leander presently has a population estimated at over 55,000. The Leander Independent School District has grown into the largest school district in Williamson County and the fastest growing district in the state of Texas. It presently has a total of six high schools, eight middle schools and twenty-six elementary schools. It encompasses the cities of Leander, Cedar Park, Jonestown, and parts of Northwest Austin. New businesses are on their way and the residential growth that has been experienced over the past few years is phenomenal. Many changes have occurred since the little town of Bagdad. The City of Leander continues to grow and prosper and we invite everyone to come and experience our extraordinary hill country city.